1 A None No Power Seat 1 A is a singular rearward facing Qsuite with the forward bulkhead located directly behind. The Qsuite along the side of the aircraft features a seat that is away from the aisle, transforms into a fully lie-flat bed, contains a large entertainment monitor, and has a sliding door with a "Do Not Disturb" feature to provide true privacy. 1 E None No Power Seat 1 E is a rearward facing Qsuite seat in the Quad setup. The forward bulkhead is located directly behind. The Qsuite seat features a seat that transforms into a fully lie-flat bed, a large entertainment monitor, and a sliding door with a "Do Not Disturb" feature to provide true privacy. The seat and the one adjacent may be made into a double bed. Additionally, moveable panels may be opened to form the Quad setup. The panels open up to join the seat with the direct adjacent seat plus the two that are adjacent and directly ahead to transform the space into a social area. The Quad set-up is ideal for families, friends, and/or colleagues traveling together. The proximity to the galley and lavatory area might be bothersome. 1 F None No Power Seat 1 F is a rearward facing Qsuite seat in the Quad setup. The forward bulkhead is located directly behind. The Qsuite seat features a seat that transforms into a fully lie-flat bed, a large entertainment monitor, and a sliding door with a "Do Not Disturb" feature to provide true privacy. The seat and the one adjacent may be made into a double bed. Additionally, moveable panels may be opened to form the Quad setup. The panels open up to join the seat with the direct adjacent seat plus the two that are adjacent and directly ahead to transform the space into a social area. The Quad set-up is ideal for families, friends, and/or colleagues traveling together. The proximity to the galley and lavatory area might be bothersome. 1 K None No Power Seat 1 K is a singular rearward facing Qsuite with the forward bulkhead located directly behind. The Qsuite along the side of the aircraft features a seat that is away from the aisle, transforms into a fully lie-flat bed, contains a large entertainment monitor, and has a sliding door with a "Do Not Disturb" feature to provide true privacy. 10 A None No Power Seat 10 A is a singular rearward facing Qsuite. The Qsuite along the side of the aircraft features a seat that is away from the aisle, transforms into a fully lie-flat bed, contains a large entertainment monitor, and has a sliding door with a "Do Not Disturb" feature to provide true privacy. 10 D None No Power Seat 10 D is a forward facing Qsuite seat in the Quad setup. The Qsuite seat features a seat that transforms into a fully lie-flat bed, a large entertainment monitor, and a sliding door with a "Do Not Disturb" feature to provide true privacy. Additionally, moveable panels may be opened to form the Quad setup. The panels open up to join the seat with the direct adjacent seat plus the two that are adjacent and directly ahead to transform the space into a social area. The Quad set-up is ideal for families, friends, and/or colleagues traveling together. 10 G None No Power Seat 10 G is a forward facing Qsuite seat in the Quad setup. The Qsuite seat features a seat that transforms into a fully lie-flat bed, a large entertainment monitor, and a sliding door with a "Do Not Disturb" feature to provide true privacy. Additionally, moveable panels may be opened to form the Quad setup. The panels open up to join the seat with the direct adjacent seat plus the two that are adjacent and directly ahead to transform the space into a social area. The Quad set-up is ideal for families, friends, and/or colleagues traveling together. 10 K None No Power Seat 10 K is a singular rearward facing Qsuite. The Qsuite along the side of the aircraft features a seat that is away from the aisle, transforms into a fully lie-flat bed, contains a large entertainment monitor, and has a sliding door with a "Do Not Disturb" feature to provide true privacy. 11 B None No Power Seat 11 B is a singular forward facing Qsuite. The Qsuite along the side of the aircraft features a seat that transforms into a fully lie-flat bed, a large entertainment monitor, and a sliding door with a "Do Not Disturb" feature to provide true privacy. 11 E None No Power Seat 11 E is a rearward facing Qsuite seat in the Quad setup. The Qsuite seat features a seat that transforms into a fully lie-flat bed, a large entertainment monitor, and a sliding door with a "Do Not Disturb" feature to provide true privacy. The seat and the one adjacent may be made into a double bed. 11 F None No Power Seat 11 F is a rearward facing Qsuite seat in the Quad setup. The Qsuite seat features a seat that transforms into a fully lie-flat bed, a large entertainment monitor, and a sliding door with a "Do Not Disturb" feature to provide true privacy. The seat and the one adjacent may be made into a double bed. 11 J None No Power Seat 11 J is a singular forward facing Qsuite. The Qsuite along the side of the aircraft features a seat that transforms into a fully lie-flat bed, a large entertainment monitor, and a sliding door with a "Do Not Disturb" feature to provide true privacy. 16 A None No Power Seat 16 A is a standard Economy Class seat that might feature additional, although stretch restrictive, legroom due to the location at a bulkhead. The tray table is installed in a fixed armrest, therefore, seat width is slightly reduced. Floor storage for personal items is not available for use during takeoff and landing. 16 B None No Power Seat 16 B is a standard Economy Class seat that might feature additional, although stretch restrictive, legroom due to the location at a bulkhead. The tray table is installed in a fixed armrest, therefore, seat width is slightly reduced. Floor storage for personal items is not available for use during takeoff and landing. 16 C None No Power Seat 16 C is a standard Economy Class seat that might feature additional, although stretch restrictive, legroom due to the location at a bulkhead. The tray table is installed in a fixed armrest, therefore, seat width is slightly reduced. Floor storage for personal items is not available for use during takeoff and landing. 16 H None No Power Seat 16 H is a standard Economy Class seat that might feature additional, although stretch restrictive, legroom due to the location at a bulkhead. The tray table is installed in a fixed armrest, therefore, seat width is slightly reduced. Floor storage for personal items is not available for use during takeoff and landing. 16 J None No Power Seat 16 J is a standard Economy Class seat that might feature additional, although stretch restrictive, legroom due to the location at a bulkhead. The tray table is installed in a fixed armrest, therefore, seat width is slightly reduced. Floor storage for personal items is not available for use during takeoff and landing. 16 K None No Power Seat 16 K is a standard Economy Class seat that might feature additional, although stretch restrictive, legroom due to the location at a bulkhead. The tray table is installed in a fixed armrest, therefore, seat width is slightly reduced. Floor storage for personal items is not available for use during takeoff and landing. 17 D None No Power Seat 17 D is a standard Economy Class seat that has additional legroom due to the position of the bulkhead. The tray table and inflight entertainment monitor are installed in a fixed armrest, therefore, seat width is slightly reduced. Floor storage for personal items is not available for use during takeoff and landing. 17 E None No Power Seat 17 E is a standard Economy Class seat that has additional legroom due to the position of the bulkhead. The tray table and inflight entertainment monitor are installed in a fixed armrest, therefore, seat width is slightly reduced. Floor storage for personal items is not available for use during takeoff and landing. 17 F None No Power Seat 17 F is a standard Economy Class seat that has additional legroom due to the position of the bulkhead. The tray table and inflight entertainment monitor are installed in a fixed armrest, therefore, seat width is slightly reduced. Floor storage for personal items is not available for use during takeoff and landing. 19 D None No Power Seat 19 D is a standard Economy Class seat that has additional legroom due to the lack of a seat in front. However, due to aisle positioning, a passenger might be bumped by passengers and crew passing from the front of the aircraft. The tray table and inflight entertainment monitor are installed in a fixed armrest, therefore, seat width is slightly reduced. Floor storage for personal items is not available for use during takeoff and landing. 2 B None No Power Seat 2 B is a singular forward facing Qsuite. The Qsuite along the side of the aircraft features a seat that transforms into a fully lie-flat bed, a large entertainment monitor, and a sliding door with a "Do Not Disturb" feature to provide true privacy. 2 D None No Power Seat 2 D is a forward facing Qsuite seat in the Quad setup. The Qsuite seat features a seat that transforms into a fully lie-flat bed, a large entertainment monitor, and a sliding door with a "Do Not Disturb" feature to provide true privacy. Additionally, moveable panels may be opened to form the Quad setup. The panels open up to join the seat with the direct adjacent seat plus the two that are adjacent and directly ahead to transform the space into a social area. The Quad set-up is ideal for families, friends, and/or colleagues traveling together. 2 G None No Power Seat 2 G is a forward facing Qsuite seat in the Quad setup. The Qsuite seat features a seat that transforms into a fully lie-flat bed, a large entertainment monitor, and a sliding door with a "Do Not Disturb" feature to provide true privacy. Additionally, moveable panels may be opened to form the Quad setup. The panels open up to join the seat with the direct adjacent seat plus the two that are adjacent and directly ahead to transform the space into a social area. The Quad set-up is ideal for families, friends, and/or colleagues traveling together. 2 J None No Power Seat 2 J is a singular forward facing Qsuite. The Qsuite along the side of the aircraft features a seat that transforms into a fully lie-flat bed, a large entertainment monitor, and a sliding door with a "Do Not Disturb" feature to provide true privacy. 25 A None No Power Seat 25 A is a standard Economy Class seat. The proximity to the galley and lavatory area might be bothersome. 25 B None No Power Seat 25 B is a standard Economy Class seat. The proximity to the galley and lavatory area might be bothersome. 25 C None No Power Seat 25 C is a standard Economy Class seat. The proximity to the galley and lavatory area might be bothersome. 25 D None No Power Seat 25 D is a standard Economy Class seat. The proximity to the galley and lavatory area might be bothersome. 25 G None No Power Seat 25 G is a standard Economy Class seat. The proximity to the galley and lavatory area might be bothersome. 25 H None No Power Seat 25 H is a standard Economy Class seat. The proximity to the galley and lavatory area might be bothersome. 25 J None No Power Seat 25 J is a standard Economy Class seat. The proximity to the galley and lavatory area might be bothersome. 25 K None No Power Seat 25 K is a standard Economy Class seat. The proximity to the galley and lavatory area might be bothersome. 26 D None No Power Seat 26 D is a standard Economy Class seat located between lavatories. The proximity to the galley and lavatory area might be bothersome. 26 E None No Power Seat 26 E is a standard Economy Class seat located between lavatories. The proximity to the galley and lavatory area might be bothersome. 26 F None No Power Seat 26 F is a standard Economy Class seat located between lavatories. The proximity to the galley and lavatory area might be bothersome. 26 G None No Power Seat 26 G is a standard Economy Class seat located between lavatories. The proximity to the galley and lavatory area might be bothersome. 27 A None No Power Seat 27 A is a standard Economy Class seat has additional legroom due to the Exit Row. The tray table is installed in a fixed armrest, therefore, seat width is slightly reduced. Floor storage for personal items is not available for use during takeoff and landing. 27 B None No Power Seat 27 B is a standard Economy Class seat has additional legroom due to the Exit Row. The tray table is installed in a fixed armrest, therefore, seat width is slightly reduced. Floor storage for personal items is not available for use during takeoff and landing. 27 C None No Power Seat 27 C is a standard Economy Class seat has additional legroom due to the Exit Row. The tray table is installed in a fixed armrest, therefore, seat width is slightly reduced. Floor storage for personal items is not available for use during takeoff and landing. 27 D None No Power Seat 27 D is a standard Economy Class seat has additional legroom due to the Exit Row, however, the proximity to the lavatory and galley area may be bothersome. The tray table is installed in a fixed armrest, therefore, seat width is slightly reduced. Floor storage for personal items is not available for use during takeoff and landing. 27 E None No Power Seat 27 E is a standard Economy Class seat has additional legroom due to the Exit Row, however, the proximity to the lavatory and galley area may be bothersome. The tray table is installed in a fixed armrest, therefore, seat width is slightly reduced. Floor storage for personal items is not available for use during takeoff and landing. 27 F None No Power Seat 27 F is a standard Economy Class seat has additional legroom due to the Exit Row, however, the proximity to the lavatory and galley area may be bothersome. The tray table is installed in a fixed armrest, therefore, seat width is slightly reduced. Floor storage for personal items is not available for use during takeoff and landing. 27 H None No Power Seat 27 H is a standard Economy Class seat has additional legroom due to the Exit Row. The tray table is installed in a fixed armrest, therefore, seat width is slightly reduced. Floor storage for personal items is not available for use during takeoff and landing. 27 J None No Power Seat 27 J is a standard Economy Class seat has additional legroom due to the Exit Row. The tray table is installed in a fixed armrest, therefore, seat width is slightly reduced. Floor storage for personal items is not available for use during takeoff and landing. 27 K None No Power Seat 27 K is a standard Economy Class seat has additional legroom due to the Exit Row. The tray table is installed in a fixed armrest, therefore, seat width is slightly reduced. Floor storage for personal items is not available for use during takeoff and landing. 29 D None No Power Seat 29 D is a standard Economy Class seat that has additional legroom due to the lack of a seat in front. However, due to aisle positioning, a passenger might be bumped by passengers and crew passing from the front of the aircraft. The tray table and inflight entertainment monitor are installed in a fixed armrest, therefore, seat width is slightly reduced. Floor storage for personal items is not available for use during takeoff and landing. 3 A None No Power Seat 3 A is a singular rearward facing Qsuite. The Qsuite along the side of the aircraft features a seat that is away from the aisle, transforms into a fully lie-flat bed, contains a large entertainment monitor, and has a sliding door with a "Do Not Disturb" feature to provide true privacy. 3 E None No Power Seat 3 E is a rearward facing Qsuite seat in the Quad setup. The Qsuite seat features a seat that transforms into a fully lie-flat bed, a large entertainment monitor, and a sliding door with a "Do Not Disturb" feature to provide true privacy. The seat and the one adjacent may be made into a double bed. Additionally, moveable panels may be opened to form the Quad setup. The panels open up to join the seat with the direct adjacent seat plus the two that are adjacent and directly ahead to transform the space into a social area. The Quad set-up is ideal for families, friends, and/or colleagues traveling together. 3 F None No Power Seat 3 F is a rearward facing Qsuite seat in the Quad setup. The Qsuite seat features a seat that transforms into a fully lie-flat bed, a large entertainment monitor, and a sliding door with a "Do Not Disturb" feature to provide true privacy. The seat and the one adjacent may be made into a double bed. Additionally, moveable panels may be opened to form the Quad setup. The panels open up to join the seat with the direct adjacent seat plus the two that are adjacent and directly ahead to transform the space into a social area. The Quad set-up is ideal for families, friends, and/or colleagues traveling together. 3 K None No Power Seat 3 K is a singular rearward facing Qsuite. The Qsuite along the side of the aircraft features a seat that is away from the aisle, transforms into a fully lie-flat bed, contains a large entertainment monitor, and has a sliding door with a "Do Not Disturb" feature to provide true privacy. 36 D None No Power Seat 36 D is a standard Economy Class seat, however, due to aisle positioning, a passenger might be bumped by passengers and crew. 39 C None No Power Seat 39 C is a standard Economy Class seat, however, due to aisle positioning, a passenger might be bumped by passengers and crew. 39 H None No Power Seat 39 H is a standard Economy Class seat, however, due to aisle positioning, a passenger might be bumped by passengers and crew. 4 B None No Power Seat 4 B is a singular forward facing Qsuite. The Qsuite along the side of the aircraft features a seat that transforms into a fully lie-flat bed, a large entertainment monitor, and a sliding door with a "Do Not Disturb" feature to provide true privacy. 4 D None No Power Seat 4 D is a forward facing Qsuite seat in the Quad setup. The Qsuite seat features a seat that transforms into a fully lie-flat bed, a large entertainment monitor, and a sliding door with a "Do Not Disturb" feature to provide true privacy. Additionally, moveable panels may be opened to form the Quad setup. The panels open up to join the seat with the direct adjacent seat plus the two that are adjacent and directly ahead to transform the space into a social area. The Quad set-up is ideal for families, friends, and/or colleagues traveling together. 4 G None No Power Seat 4 G is a forward facing Qsuite seat in the Quad setup. The Qsuite seat features a seat that transforms into a fully lie-flat bed, a large entertainment monitor, and a sliding door with a "Do Not Disturb" feature to provide true privacy. Additionally, moveable panels may be opened to form the Quad setup. The panels open up to join the seat with the direct adjacent seat plus the two that are adjacent and directly ahead to transform the space into a social area. The Quad set-up is ideal for families, friends, and/or colleagues traveling together. 4 J None No Power Seat 4 J is a singular forward facing Qsuite. The Qsuite along the side of the aircraft features a seat that transforms into a fully lie-flat bed, a large entertainment monitor, and a sliding door with a "Do Not Disturb" feature to provide true privacy. 40 A None No Power Seat 40 A is a standard Economy Class seat located in a last row of the aircraft. Seat back recline might be limited due to the wall directly behind. Also, if the seat back in front is reclined, then personal space will be reduced. The proximity to the galley and lavatory area might be bothersome. 40 B None No Power Seat 40 B is a standard Economy Class seat located in a last row of the aircraft. Seat back recline might be limited due to the wall directly behind. Also, if the seat back in front is reclined, then personal space will be reduced. The proximity to the galley and lavatory area might be bothersome. 40 D None No Power Seat 40 D is a standard Economy Class seat located in a last row of the aircraft. Seat back recline might be limited due to the wall directly behind. Also, if the seat back in front is reclined, then personal space will be reduced. The proximity to the galley and lavatory area might be bothersome. 40 E None No Power Seat 40 E is a standard Economy Class seat located in a last row of the aircraft. Seat back recline might be limited due to the wall directly behind. Also, if the seat back in front is reclined, then personal space will be reduced. The proximity to the galley and lavatory area might be bothersome. 40 F None No Power Seat 40 F is a standard Economy Class seat located in a last row of the aircraft. Seat back recline might be limited due to the wall directly behind. Also, if the seat back in front is reclined, then personal space will be reduced. The proximity to the galley and lavatory area might be bothersome. 40 J None No Power Seat 40 J is a standard Economy Class seat located in a last row of the aircraft. Seat back recline might be limited due to the wall directly behind. Also, if the seat back in front is reclined, then personal space will be reduced. The proximity to the galley and lavatory area might be bothersome. 40 K None No Power Seat 40 K is a standard Economy Class seat located in a last row of the aircraft. Seat back recline might be limited due to the wall directly behind. Also, if the seat back in front is reclined, then personal space will be reduced. The proximity to the galley and lavatory area might be bothersome. 5 A None No Power Seat 5 A is a singular rearward facing Qsuite. The Qsuite along the side of the aircraft features a seat that is away from the aisle, transforms into a fully lie-flat bed, contains a large entertainment monitor, and has a sliding door with a "Do Not Disturb" feature to provide true privacy. 5 E None No Power Seat 5 E is a rearward facing Qsuite seat in the Quad setup. The Qsuite seat features a seat that transforms into a fully lie-flat bed, a large entertainment monitor, and a sliding door with a "Do Not Disturb" feature to provide true privacy. The seat and the one adjacent may be made into a double bed. Additionally, moveable panels may be opened to form the Quad setup. The panels open up to join the seat with the direct adjacent seat plus the two that are adjacent and directly ahead to transform the space into a social area. The Quad set-up is ideal for families, friends, and/or colleagues traveling together. 5 F None No Power Seat 5 F is a rearward facing Qsuite seat in the Quad setup. The Qsuite seat features a seat that transforms into a fully lie-flat bed, a large entertainment monitor, and a sliding door with a "Do Not Disturb" feature to provide true privacy. The seat and the one adjacent may be made into a double bed. Additionally, moveable panels may be opened to form the Quad setup. The panels open up to join the seat with the direct adjacent seat plus the two that are adjacent and directly ahead to transform the space into a social area. The Quad set-up is ideal for families, friends, and/or colleagues traveling together. 5 K None No Power Seat 5 K is a singular rearward facing Qsuite. The Qsuite along the side of the aircraft features a seat that is away from the aisle, transforms into a fully lie-flat bed, contains a large entertainment monitor, and has a sliding door with a "Do Not Disturb" feature to provide true privacy. 6 B None No Power Seat 6 B is a singular forward facing Qsuite. The rear cabin bulkhead is located directly behind. The Qsuite along the side of the aircraft features a seat that transforms into a fully lie-flat bed, a large entertainment monitor, and a sliding door with a "Do Not Disturb" feature to provide true privacy. The proximity to the galley and lavatory area might be bothersome. 6 D None No Power Seat 6 D is a forward facing Qsuite seat in the Quad setup. The rear cabin bulkhead is located directly behind. The Qsuite seat features a seat that transforms into a fully lie-flat bed, a large entertainment monitor, and a sliding door with a "Do Not Disturb" feature to provide true privacy. The seat and the one adjacent may be made into a double bed. Additionally, moveable panels may be opened to form the Quad setup. The panels open up to join the seat with the direct adjacent seat plus the two that are adjacent and directly ahead to transform the space into a social area. The Quad set-up is ideal for families, friends, and/or colleagues traveling together. The proximity to the galley and lavatory area might be bothersome. 6 G None No Power Seat 6 G is a forward facing Qsuite seat in the Quad setup. The rear cabin bulkhead is located directly behind. The Qsuite seat features a seat that transforms into a fully lie-flat bed, a large entertainment monitor, and a sliding door with a "Do Not Disturb" feature to provide true privacy. The seat and the one adjacent may be made into a double bed. Additionally, moveable panels may be opened to form the Quad setup. The panels open up to join the seat with the direct adjacent seat plus the two that are adjacent and directly ahead to transform the space into a social area. The Quad set-up is ideal for families, friends, and/or colleagues traveling together. The proximity to the galley and lavatory area might be bothersome. 6 J None No Power Seat 6 J is a singular forward facing Qsuite. The rear cabin bulkhead is located directly behind. The Qsuite along the side of the aircraft features a seat that transforms into a fully lie-flat bed, a large entertainment monitor, and a sliding door with a "Do Not Disturb" feature to provide true privacy. The proximity to the galley and lavatory area might be bothersome. 7 E None No Power Seat 7 E is a rearward facing Qsuite seat in the Quad setup. The forward bulkhead is located directly behind. The Qsuite seat features a seat that transforms into a fully lie-flat bed, a large entertainment monitor, and a sliding door with a "Do Not Disturb" feature to provide true privacy. The seat and the one adjacent may be made into a double bed. Additionally, moveable panels may be opened to form the Quad setup. The panels open up to join the seat with the direct adjacent seat plus the two that are adjacent and directly ahead to transform the space into a social area. The Quad set-up is ideal for families, friends, and/or colleagues traveling together. The proximity to the galley and lavatory area might be bothersome. 7 F None No Power Seat 7 F is a rearward facing Qsuite seat in the Quad setup. The forward bulkhead is located directly behind. The Qsuite seat features a seat that transforms into a fully lie-flat bed, a large entertainment monitor, and a sliding door with a "Do Not Disturb" feature to provide true privacy. The seat and the one adjacent may be made into a double bed. Additionally, moveable panels may be opened to form the Quad setup. The panels open up to join the seat with the direct adjacent seat plus the two that are adjacent and directly ahead to transform the space into a social area. The Quad set-up is ideal for families, friends, and/or colleagues traveling together. The proximity to the galley and lavatory area might be bothersome. 8 A None No Power Seat 8 A is a singular rearward facing Qsuite with the forward bulkhead located directly behind. The Qsuite along the side of the aircraft features a seat that is away from the aisle, transforms into a fully lie-flat bed, contains a large entertainment monitor, and has a sliding door with a "Do Not Disturb" feature to provide true privacy. The proximity to the galley and lavatory area might be bothersome. 8 D None No Power Seat 8 D is a forward facing Qsuite seat in the Quad setup. The Qsuite seat features a seat that transforms into a fully lie-flat bed, a large entertainment monitor, and a sliding door with a "Do Not Disturb" feature to provide true privacy. Additionally, moveable panels may be opened to form the Quad setup. The panels open up to join the seat with the direct adjacent seat plus the two that are adjacent and directly ahead to transform the space into a social area. The Quad set-up is ideal for families, friends, and/or colleagues traveling together. 8 G None No Power Seat 8 G is a forward facing Qsuite seat in the Quad setup. The Qsuite seat features a seat that transforms into a fully lie-flat bed, a large entertainment monitor, and a sliding door with a "Do Not Disturb" feature to provide true privacy. Additionally, moveable panels may be opened to form the Quad setup. The panels open up to join the seat with the direct adjacent seat plus the two that are adjacent and directly ahead to transform the space into a social area. The Quad set-up is ideal for families, friends, and/or colleagues traveling together. 8 K None No Power Seat 8 K is a singular rearward facing Qsuite with the forward bulkhead located directly behind. The Qsuite along the side of the aircraft features a seat that is away from the aisle, transforms into a fully lie-flat bed, contains a large entertainment monitor, and has a sliding door with a "Do Not Disturb" feature to provide true privacy. The proximity to the galley and lavatory area might be bothersome. 9 B None No Power Seat 9 B is a singular forward facing Qsuite. The Qsuite along the side of the aircraft features a seat that transforms into a fully lie-flat bed, a large entertainment monitor, and a sliding door with a "Do Not Disturb" feature to provide true privacy. 9 E None No Power Seat 9 E is a rearward facing Qsuite seat in the Quad setup. The Qsuite seat features a seat that transforms into a fully lie-flat bed, a large entertainment monitor, and a sliding door with a "Do Not Disturb" feature to provide true privacy. The seat and the one adjacent may be made into a double bed. Additionally, moveable panels may be opened to form the Quad setup. The panels open up to join the seat with the direct adjacent seat plus the two that are adjacent and directly ahead to transform the space into a social area. The Quad set-up is ideal for families, friends, and/or colleagues traveling together. 9 F None No Power Seat 9 F is a rearward facing Qsuite seat in the Quad setup. The Qsuite seat features a seat that transforms into a fully lie-flat bed, a large entertainment monitor, and a sliding door with a "Do Not Disturb" feature to provide true privacy. The seat and the one adjacent may be made into a double bed. Additionally, moveable panels may be opened to form the Quad setup. The panels open up to join the seat with the direct adjacent seat plus the two that are adjacent and directly ahead to transform the space into a social area. The Quad set-up is ideal for families, friends, and/or colleagues traveling together. 9 J None No Power Seat 9 J is a singular forward facing Qsuite. The Qsuite along the side of the aircraft features a seat that transforms into a fully lie-flat bed, a large entertainment monitor, and a sliding door with a "Do Not Disturb" feature to provide true privacy. All Business Class and Economy Class seats feature AC power ports. All seats have USB ports. Qatar provides WiFi on this aircraft. Qatar Airways is operating this Boeing 777-200LR with their Qsuite product on a variety of long-haul destinations. This aircraft is configured with only two classes of service where all Business Class seats feature 180 degree recline. Also, this aircraft flies with 42 seats in Business Class and 230 seats in Economy Class. Qsuite offers ambient mood lighting, fully lie-flat beds and generous storage space, creating a new standard in comfort. A unique feature of Qatar's Qsuite is their first-ever cabin to offer aft and forward-facing seats, which creates a quad cabin. Built into these seats are movable panels that allow passengers to transform the space into a social area, allowing you to work, dine or socialise at 40,000 feet. When you are done socializing, you are able to put the panels back up and transform the quad space into your own private room. 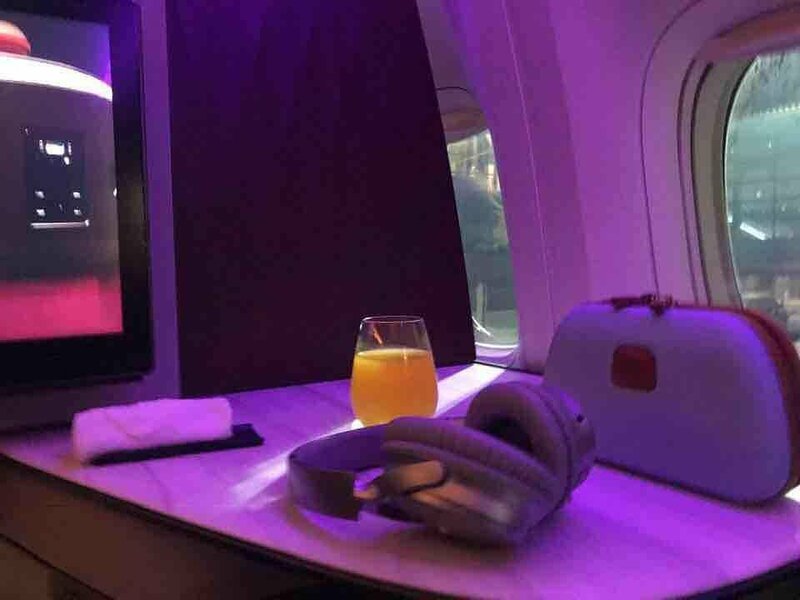 Qatar Airways flies 2 versions of Boeing 777-200LR.